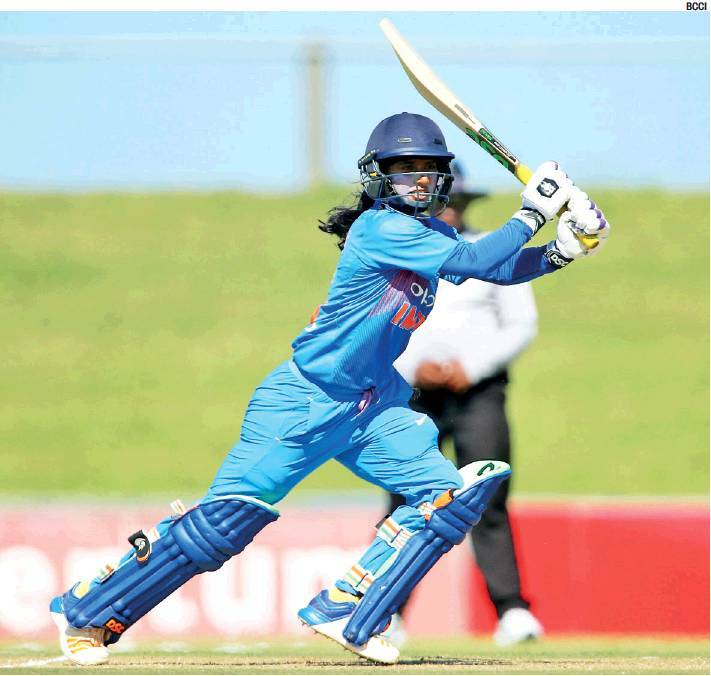 Indian women accomplished a historic double as they outclassed South Africa women by 54 runs in the fifth and final Twenty20 International to clinch the series 3-1 yesterday in Cape Town. After Mithali Raj led the side to a 2-1 series win in the ODIs, it was Harmanpreet Kaur’s turn to lift the trophy as they become the first cricket team to win two formats in the Rainbow nation. It was Mithali’s (62 off 50 balls) experience complemented by youthful exuberance of17-year old Mumbai girl Jemimah Rodrigues (44 off 34 balls) that enabled India to register a par score of 166 for four in 20 overs. South Africa were never in the chase as they were skittled out for 112 in 18 overs with veteran Rumeli Dhar (3/26 in 4 overs) making a mark in the very second match on her return to the side after six years. Shikha Pandey (3/16 in 3 overs) was certainly the best bowler on view while left-arm spinner Rajeshwari Gayakwad (3/26 in 3 overs) had an easy job with the top half blown away by the seamers. The win also showed that Indian women’s performance last year in the ICC ODI World Cup – where they made the final – wasn’t a mere flash in pan. The women showed little rustiness even though they were playing their first international series in seven months, after the World Cup. The big positive was winning a T20 series – a format where the Indian women have not done well traditionally. “It was a two-paced track to bat on but it became easier to play shots at the later stages. It’s always nice to be among runs,” said Raj, who scored 192 runs in four innings with three halfcenturies. She won both ‘Player of the Match’ and ‘Player of the Series’ awards for her consistent scores. Skipper Harmanpreet spoke about how the series win will bolster their confidence as they get ready to take on Australia and England at home. “I thought we were 20 runs short but our bowlers performed exceptionally. “Mithali di and Jemi (Jemimah) batted well. Shikha and PY (Poonam Yadav) really bowled well,” the skipper said. Mithali started with a couple of boundaries off seamer Shabnim Ismail before launching into medium pacer Masabata Klaas. She then hit a couple of sixes – one against off-break bowler Raisibe Ntozakhe and the other off rival captain Dane van Niekerk – both over long-on. Along with Jemimah, Mithali added 98 runs for the second wicket. The most talked about teenager in women’s cricket circuit, Jemimah played her first innings of note at the international level and despite being pint-sized, she packed a punch in her shots. Rodrigues also punished Ntozakhe hitting her through cover for a boundary and also a six over mid-wicket. When Ismail came for her second spell, the teen sensation lofted her effortlessly over long-on for a six. Interestingly, Mithali had made her ODI debut (June 1999) 15 months before Jemimah was born in September 2000.